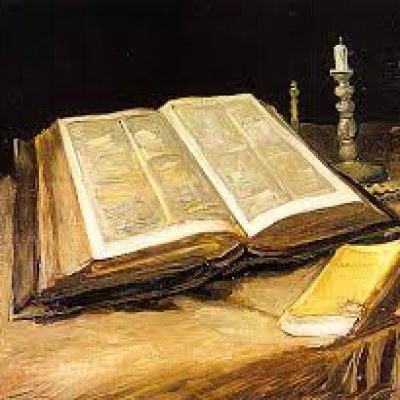 We believe that the Holy Bible was written by men divinely inspired, and is a perfect treasure of heavenly instruction; that it has God for its author, salvation for its end, and truth without any mixture of error for its matter; that it reveals the principles by which God will judge us; and therefore is, and shall remain to the end of the world, the true center of Christian union, and the Supreme standard by which all human conduct, creeds and opinions should be tried. We believe that there is one, and only one living and true God, an infinite, intelligent Spirit, whose name is JEHOVAH, the Maker and Supreme Ruler of heaven and earth; inexpressibly glorious in holiness and worthy of all possible honor, confidence, and love; that in unity of the Godhead there are three persons, the Father, the Son, and Holy Ghost; equal in every divine perfection, and executing distinct but harmonious offices in the great work of redemption. We believe that man was created in holiness, under the law of his Maker; but by voluntary transgression fell from that holy and happy state, in consequence of which all mankind were made sinners, being by nature utterly void of that holiness required by the law of God, positively inclined to evil; and therefore under just condemnation to eternal ruin, without defense or excuse. We believe that the salvation of sinners is wholly of grace; through the mediatorial offices of the Son of God, Who by the appointment of the Father, freely took upon Him our nature, yet without sin; honored the divine law by His personal obedience, and by His death made a full atonement for our sins; that having risen from the dead, He is now enthroned in heaven and uniting in His wonderful person the tenderest sympathies with divine perfections, He is every way qualified to be a suitable, a compassionate, and an all-sufficient Savior. We believe that the great gospel blessing which Christ secures to such as believe in Him is justification; that justification includes the pardon of sin, and the promise of eternal life on principles of righteousness; that it is bestowed, not in consideration of any works of righteousness which we have done, but solely through faith in the Redeemer’s blood, by virtue of which faith His perfect righteousness is freely imputed to us of God; that it brings us into a state of most blessed peace and favor with God, and secures every other blessing needful for time and eternity. We believe that the blessings of salvation are made free to all by the gospel; that it is the immediate duty of all to accept them by a cordial penitent and obedient faith; and nothing prevents the salvation of the greatest sinner on earth, but his own inherent depravity and voluntary rejection of the gospel, which rejection involves him in an aggravated condemnation. We believe that in order to be saved, sinners must be regenerated, or born again; that regeneration consists in giving a holy disposition to the mind; that it is effected in a manner above our comprehension by the power of the Holy Spirit, in connection with divine truth, so as to secure our voluntary obedience to the gospel, and that its proper evidence appears in the holy fruits of repentance and faith, and newness of life. We believe that repentance and faith are sacred duties, and also inseparable graces, wrought in our souls by the regenerating Spirit of God; whereby being deeply convinced of our guilt, danger, and helplessness, and of the way of salvation by Christ, we turn to God with unfeigned contrition, confession, and supplication for mercy; at the same time heartily receiving the Lord Jesus Christ as our Prophet, Priest and King, and relying on Him alone as the only and all-sufficient Savior. We believe that election is the eternal purpose of God, according to which He graciously regenerates, sanctifies, and saves sinners; that being perfectly consistent with the free agency of man, it comprehends all means in connection with the end; that it is a most glorious display of God’s sovereign goodness, being infinitely free, wise, holy, and unchangeable; that it utterly excludes boasting, and promotes humility, love, prayer, praise, trust in God, and active imitation of His free mercy; that it encourages the use of means in the highest degree; that it may be ascertained by its effects in all who truly believe the gospel; that it is the foundation of Christian assurance; and that to ascertain it with regard to ourselves demands and deserves the utmost diligence. We believe that sanctification is the process by which, according to the will of God, we are made partakers of His holiness; that it is a progressive work, that it is begun in regeneration; and that it is carried on in the hearts of believers by the presence and power of the Holy Spirit, the Sealer and Comforter, in the continual use of the appointed means especially, the word of God, self-examination, self-denial, watchfulness, and prayer. We believe that those who are begotten unto a living hope by the resurrection of Jesus Christ from the dead, that their persevering attachment to Christ is the grand mark which distinguishes them from superficial professors, that a special providence watches over their welfare, and that they are kept by the power of God through faith unto salvation. We believe that a scriptural church is a called out visible assembly of baptized believers, convenanted together under New Testament law, for the purpose of carrying out the Great Commission, with an unbroken history from the personal ministry of Jesus on earth to the present day, and its only scriptural officers are Bishops or Pastor and Deacons and the qualifications claims and Duties are defined in the Epistles to Timothy and Titus. We believe that NEW TESTAMENT BAPTISM is the immersion in water of a believer, in the name of the FATHER, and SON, and HOLY GHOST, to show forth in a solemn and beautiful emblem, our faith in the crucified, buried, and risen SAVIOR, with its effect in our death to sin and resurrection to a new life, that it is prerequisite to the privileges of a CHURCH relation; and the LORD’S SUPPER, in which the members of the local Church by the sacred use of unleavened bread and WINE are to commemorate together the dying love of Christ; preceded always by solemn self-examination. We believe that the first day of the week is the LORD’S DAY, or Christian Sabbath, and is to be kept sacred to religious purposes, by abstaining from all unnecessary labor and sinful recreations, by devout observance of all the means of grace, both private, and public and by preparation for that rest that remaineth for the people of God. We believe in two bodily resurrections, one for the righteous, the other for the unjust, these resurrections being a thousand years apart. We believe that the living and dead just shall rise at, and follow the appearance of Christ in the air, that the wicked dead will not arise until after the MILLENNIUM, at the judgment of the great WHITE THRONE. We believe that Christ must return before the THOUSAND YEARS REIGN can come. We believe the gospel is to be preached as a witness to all nations, but we do not believe it will be anything like Universally accepted. We believe conditions will grow worse and worse in this world. We believe that wars, revolutions, and violence will fill the earth until the end, even as it was in the days of Noah’s time. We believe that the closing of this present age will witness such days of trouble, wickedness and disaster as the world has never seen. We believe that the Anti-Christ or Beast and the False Prophet, will be in power on earth when Jesus comes back to earth to reign, the Anti-Christ or Beast and False Prophet will be overcome and cast into the lake of fire, and the Devil will be bound for a THOUSAND YEARS. We believe that after this the earth shall have the THOUSAND YEARS REIGN OF CHRIST AND HIS SAINTS, and Christ will occupy the throne of David, (reestablished in Jerusalem), and reign from that throne. We believe that He will return in His Glorious body, not only in the air, but also back to this earth itself. We believe that, “the birth of Jesus was on this wise, when as His Mother Mary was espoused to Joseph. Before they came together, she was found with child of the Holy Ghost. Joseph, her husband, being a just man, and not willing to make her a public example, was minded to put her away privily, but while he thought on these things, behold the angel of the Lord appeared unto him in a dream, saying, Joseph, thou son of David, fear not that which is conceived in her is of the Holy Ghost, and she shall bring forth a son, and thou shall call his name Jesus; for He shall save His people from their sins. Now all this was done, that it might be fulfilled which was spoken of the Lord by the Prophet, saying behold a Virgin shall be with child and shall bring forth a son, and shall call his name EMMANUEL, which being interpreted is, God with us. Then Joseph being raised from sleep did as the Angel of the Lord had bidden him, and took unto him his wife; And knew her not till she had brought forth her first son; and called his name JESUS” (Matthew 1:18-25). We believe that God created man, male and female, and that marriage is the union of one man and one woman. We believe that believers are not to be unequally yoked with unbelievers.